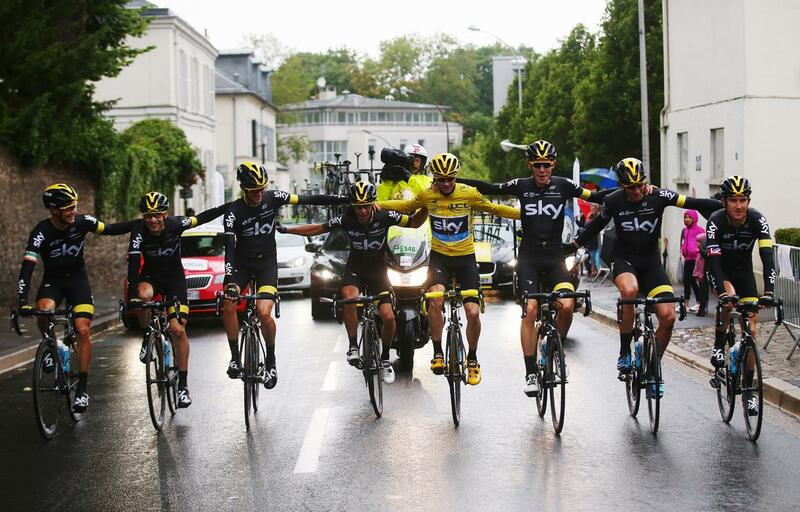 When all was said and done it was Team Sky’s Chris Froome who became the first Britain to win two Tours. Added to this he also walked away with the Polka Dot (King of the Mountains) jersey. But today belonged to the gorilla. Andre Greipel took his fourth stage victory of this year’s Tour, showing a clean pair of heels to all the other sprinters. André Greipel wins his fourth stage, the most prestigious of the 102nd Tour de France, in a perfectly timed and paced sprint to the finish line on the Champs-Élysées, Paris. Chris Froome (SKY) has been crowned for the second time on the Champs-Elysées with Nairo Quintana (MOV) and Alejandro Valverde (MOV) accompanying him on podium. Froome (SKY) is also the King of the Mountains – he joins an elite group of six riders who have won both the Individual and the King of the Mountains classifications. A mature effort; he made no mistakes, and of course had some luck. He is certainly capable and young enough to win this event a few more times. Peter Sagan (TCS) has received the green jersey for the fourth consecutive time – although he never actually won a stage. His nearest rival, André Greipel won an incredible four stages but just wasn’t as consistent over the 21 stages. Nairo Quintana (MOV), wins the white jersey for the last time at the Tour de France, born in 1990, he won’t be eligible for best young rider competition in the future. The MTN Qubeka team outperformed many of the more illustrious and fancied teams. A super boost for African cycling and what an impression they made! As the Official Technology Partner of the Tour de France, Dimension Data is privileged and proud to be part of the 2015 Tour de France phenomenon. Click here to view our Race in Review infographic, for a summary of some data we’ve collected on the journey. Read our latest Blog post from members of the Dimension Data team on the ground in France – keeping their ears to the ground for the news behind the news, providing insights and commentary to guests, executives, and fans on social media. This has been their first experience reporting from the heart of the Le Tour action, and it’s been a real eye-opener – click here to read the five things that surprised them the most. 160 riders have finally completed the 3 360 km journey from Utrecht in the Netherlands to Paris, France. The 102nd edition of the Tour de France has taken them three weeks and 21 stages (9 flat, 3 hill, 7 mountain with 5 altitude finishes, 1 individual time-trial, 1 team time-trial) – with only two rest days! 41 – the number of times the Tour de France has finished on the Avenue des Champs-Élysées – first introduced in 1975. 30 million – the number of tourists who visit Paris annually, – the most visited city in the world – with: 31 monuments, 173 museums, 3 opera houses, 208 theatres and cabarets, 430 cinema screens, more than 13,500 brasseries and restaurants, and 600 km of bicycle paths. 12 – the number of riders who have won two Tour de France titles, Chris Froome (SKY) joined the club today. 11 – a new record of overall victories for Italian bike brand Pinarello – the most successful in the history of the Tour de France. 109.5 km – total distance of the final stage. 38.72 km/h – the average speed on the stage. 00’ 00” – the time gap between the first and last rider. And with that the curtain falls on this year’s Tour, a truly remarkable year! Who will be the victor in 2016, Froome again or will Quintana show them all a clean pair of heels? This entry was posted in Tour De France and tagged Andre Greipel, Chris Froome, Tour De France, Tour De France 2015. Bookmark the permalink.